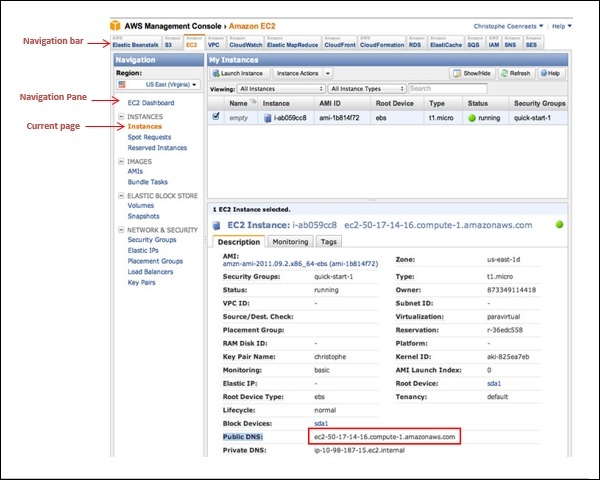 AWS Management Console is a web application for managing Amazon Web Services. 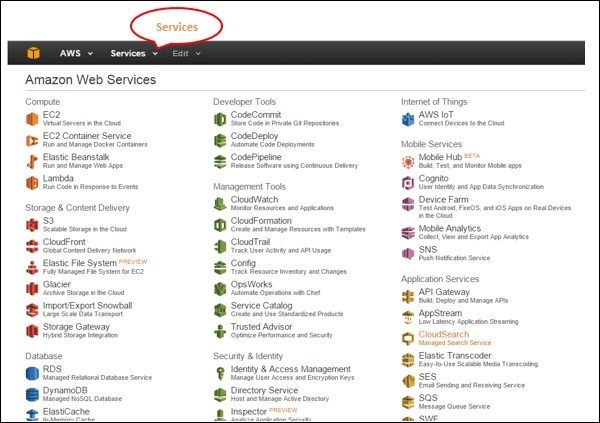 AWS Management Console consists of list of various services to choose from. It also provides all information related to our account like billing. This console provides an inbuilt user interface to perform AWS tasks like working with Amazon S3 buckets, launching and connecting to Amazon EC2 instances, setting Amazon CloudWatch alarms, etc. 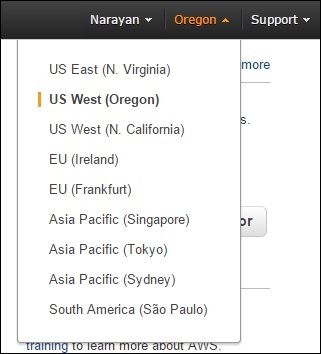 Following is the screenshot of AWS management console for Amazon EC2 service. Step 1 − Click on services. We get a list of various services. Step 2 − Select the choice from the list of categories and we get their sub-categories such as Computer and Database category is selected in the following screenshots. Step 3 − Select the service of your choice and the console of that service will open. Click the Edit menu on the navigation bar and a list of services appears. We can create their shortcuts by simply dragging them from the menu bar to the navigation bar. When we drag the service from the menu bar to the navigation bar, the shortcut will be created and added. We can also arrange them in any order. 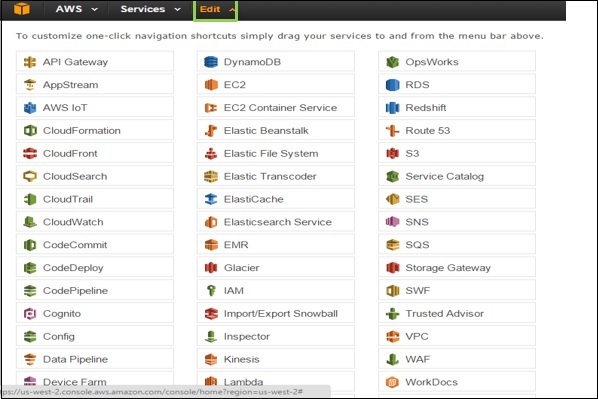 In the following screenshot we have created shortcut for S3, EMR and DynamoDB services. To delete the shortcut, click the edit menu and drag the shortcut from the navigation bar to the service menu. The shortcut will be removed. In the following screenshot, we have removed the shortcut for EMR services. Many of the services are region specific and we need to select a region so that resources can be managed. Some of the services do not require a region to be selected like AWS Identity and Access Management (IAM). We can change password of our AWS account. To change the password, following are the steps. Step 1 − Click the account name on the left side of the navigation bar. 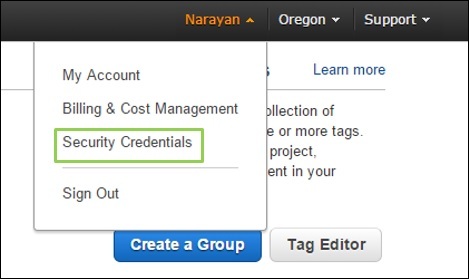 Step 2 − Choose Security Credentials and a new page will open having various options. Select the password option to change the password and follow the instructions. Step 3 − After signing-in, a page opens again having certain options to change the password and follow the instructions. When successful, we will receive a confirmation message. 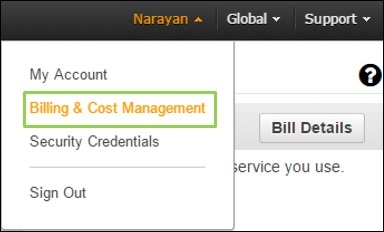 Click the account name in the navigation bar and select the 'Billing & Cost Management' option. Now a new page will open having all the information related to money section. Using this service, we can pay AWS bills, monitor our usage and budget estimation.